Try as they might, some people just never seem to master the art of throwing a frisbee. 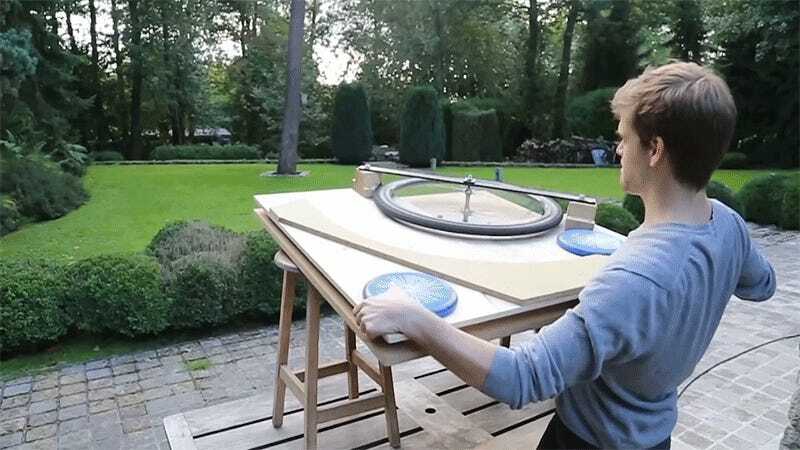 If you’re one of them, in this video La Fabrique DIY shows you how to turn a bike wheel and an old drill into a frisbee launcher with impressive range. Getting the perfect curve on the board that serves as the frisbee’s guide might take some trial and error, but when you nail it your frisbees are going to fly for a long time thanks to their perfect spin. And it doesn’t hurt that the bike wheel launcher here is spinning at close to 60 miles per hour when it gets up to speed. In other words, you’ll want to keep any fingers you want to keep well clear of it if you decide to build your own.